I don’t know about other folks, but Labor Day weekend is really my time to bubble and boil in my kitchen undisturbed. I have the house to myself since I send my husband off to one music event or another for the entire weekend. Most of my other friends are either dealing with getting their children settled back into school or taking one last little vacation. So what’s a girl to do with herself when she’s got the time on her hands? Make chicken stock to cook with all Fall and Winter! The weather is usually nice and cool by September here in Maryland. I open every window in the house and turn up the stove. I start in the morning and take all day to simmer the stock. It’s so pleasingly domestic for me. I like to cook, but usually it’s under time constraints or while my stomach is growling. Having a day without any other considerations but making a flavorful food component that I’ll use to make soups, casseroles, enhance the flavor of veggies and rice and other random food items for the entire cold weather season. Let me tell you my labor day weekend schedule. I wake up from a nice sleep in and head out to a local diner for an elaborate breakfast. Then I go to the produce store for all the flavor agents: onions, carrots, celery, etc. I linger over my selections in the blissfully uncrowded store. When I get home, I take out all the chicken carcasses I’ve been hording since last winter. If you’ve got the freezer space, it’s worth it to save those chicken bones. Also the neck and gizzards. But if you don’t have the space or it never occurred to you to save ’em- have no fear. According to Ina Garten, you can actually just buy raw roasting chickens from the store and plunge them into your stock pot. And Alton Brown maintains that if you don’t have enough carcass to reach four pounds, you can add in some chicken wings. But if you have the bones, necks, etc. from chicken dinners of yore, just use them. And if you want to get really technical, using the meat from the chicken actually produces a broth, not a stock. But hey! Broth is still delicious and will do its duty to enhance your cooking. The stock however is going to be more flavorful and have a richer mouth feel thanks to the gelatin being released from the bones. I promise you though, if you serve your friends chicken noodle soup made with a broth versus a stock, they’ll never know the difference. Only a certified chef would see through your ruse. And then, he or she would probably have the decency to not say anything. They’re not all Gordon Ramsay after all. Now one pickle that I run into is the amount of water I have to use. In order to make a quality stock, you have to have at least two gallons of water. And I don’t have a single pot in my house that will hold that much water. Most recipes require that you actually have a 12 quart stock pot. I would absolutely love to add one to my kitchen, but it seems too much like overkill since I’d only use it once a year to make stock. So I improvise. I have two pasta pots and that will have to do. So I put one gallon of water (16 cups, 3.8 liters) into each pot. Then I split all the ingredients evenly between the two pots, including the chicken carcasses. When all the cooking is done, I mix the liquid from both pots together into the only thing I have that will hold two gallons- a pitcher. Usually I spoon out some of the liquid with a ladle before I attempt to lift the entire pot of stock to strain it. Just seems safer to take the weight down before lifting in order to avoid spilling hot liquid all over myself. I use a wire mesh colander to strain out the solids. Alton Brown uses two wire mesh colanders, one inside the other, with a piece of cheese cloth between the two of them. The more you strain, the clearer your stock. I’m not much of a stickler for the stock being clear, but if you’re out to impress, go for it. This is Alton Brown’s chicken stock recipe, and it’s the one I use every year. It’s simple and produces excellent results every time. But what it lacks in complex ingredients, it makes up for by being a bit labor intensive. And before you get started just know that you’re looking at SIX HOURS of simmering once you’ve assembled all the ingredients. You’ll be checking on it every 10 minutes for the first hour skimming off the foam that forms on top. Twice every hour for the next two hours. And you’ll need to keep hot water on hand to top off the pots as some of the stock evaporates for the rest of the cooking time. The real kicker is storing it after you make it. Once it’s cooled and ready for a permanent storage solution, you’ll realize you have freaking two gallons of liquid to put somewhere. And you can’t keep it in your fridge. It’ll go sour in just a couple of days. Alton Brown suggests that you freeze the stock, so that’s what I do. You can freeze in one cup portions for use in soup making, one quart portions for when you’re making a really big batch of something delicious and, of course, you can freeze in ice cube trays. That’s my favorite method because I can grab a few cubes every time I want to enhance the flavor of a dish. And I know that each cube contains about three tablespoons of stock. Once frozen, I pop them out and put them in freezer bags for use the entire season. For more tips and tricks, I highly suggest you take the time to watch this episode of Good Eats. 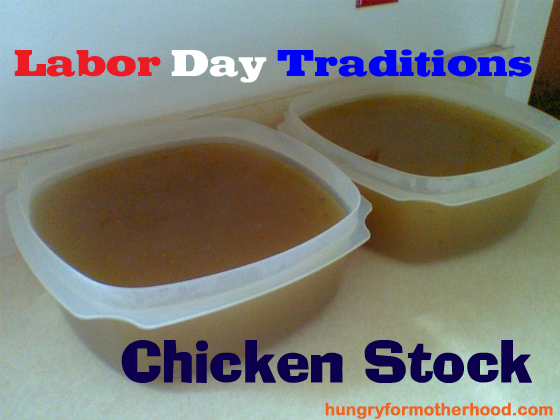 If you try your hand at stock making this labor day weekend, let me know how it went!